Bloat and the similar conditions of torsion and GDV can occur in any breed but are most prevalent in large deep-chested dogs. While it is often listed as one common to Greyhounds, here at AAGA, in over 5600 Greyhounds, we have only seen or heard of 3 to 4 cases. 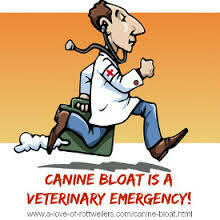 In fact, Dr Suzanne Stack, a Greyhound expert, states that “(1) bloat is mostly genetic and is more common in show (AKC) Greyhound lines; and (2) racers gobble one meal daily from a bowl on the floor and rarely bloat.” Nevertheless, owners should be aware of the condition as it is a very serious affliction that happens suddenly and requires immediate treatment (i.e., surgical intervention) by a veterinarian (within 2 hours of first symptoms) if the animal is to be saved. You can find a detailed and easily readable article on identifying bloat and its similar conditions here.